Nashville has hundreds of local spots that are overlooked every time a new bachelorette party comes to town! Don’t miss out on a great time. Many of these spots are within a mile or two of Broadway, but they are sure to float your boat! Among the top local spots in town, 12th South is one of the most popular locations for all ages and interests. Bartaco, Edley’s BBQ, Burger Up, and Josephine are a few local favorites in town. When you’re passing through town, stop by for a while and experience all of Nashville. Enjoy the college town with a city vibe in Midtown! 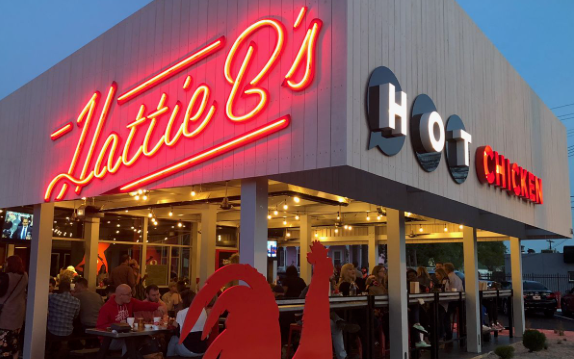 See local spots like Hattie B’s, Broadway Brewhouse, Winners, Losers, and San Antonio Taco Co. This small piece of Nashville is sure to not disappoint! Looking for the go-to place in Nashville without the hustle and bustle of Broadway? You can tour all Nashville murals and enjoy some great food and drinks while you’re at it. The Gulch features restaurants of all tastes including Party Fowl, Biscuit Love, Bar Louie, and Whiskey Kitchen.